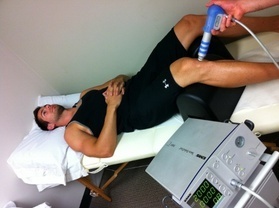 A lot of people get scammed into thinking this form of shockwave therapy will help their heel pain. 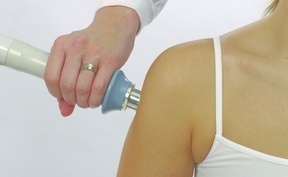 It may help to a degree, but it is nowhere near as effective as focused and true "shockwave" therapy. As you can see, they all look very similar. A cylinder shaped "gun" look to them. Ask the doctor if it is radial, and if he says that he has no clue, be very weary of him! 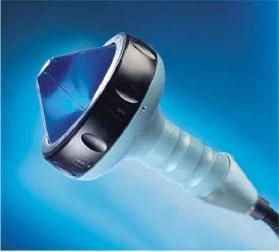 Radial Shockwave is no Good for Plantar Fasciitis... Why?? Long story short is that radial shockwave is not as "focused" as true shockwave therapy. This is because radial shockwaves disperse out to all the tissues, even the tissues that do not need the shockwave (We need those shockwaves only where the plantar fascia is damaged, and no where else). Also, a "radial" machine shockwave is not a true "shockwave" (it moves slower than a shockwave, only a "fraction" of the speed of a true shockwave) which means a lot less power is reaching the plantar fascia. Not good!! "Radial shockwave (RSWT) or more accurately, pressure wave therapy, differs from the other forms of shockwave technology in a couple major regards. First, in order for a shockwave to truly be defined as a shockwave, the energy wave must literally be faster than the speed of sound, or 1500 meters per second. This is the speed at which the "shock" of the shock wave is generated, from breaking the sound barrier. In comparison, RSWT waves travel at speeds of approximately 10 meters per second, a small fraction of true shockwave. This speed does not break the sound barrier, and hence, no actual shock wave is produced. Because no actual shockwave is produced with RSWT, and because the waveform is so different, you can better see why RSWT is not considered a shockwave technology. It is more accurately described as a pressure wave technology, and most researchers now use this term to describe this technology. 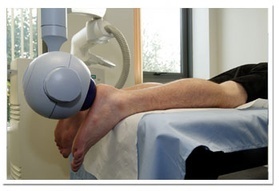 However, some facilities with these machines continue to inaccurately label their technology as shockwave therapy." Also, I wasted a ton of money getting radial shockwave, and it did NOTHING. I later had other ESWT machines show me great results, more on that in a second.. The best bang for your buck is low level ESWT. Cheapest, and most effective (what can be better than that?). But why is there a big difference between low level and high level? Long story short, low level ESWT causes the inflammatory response needed (to force the body to heal the plantar fascia) without anesthesia. 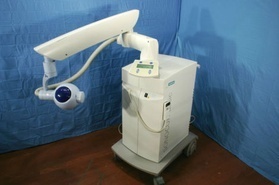 High level ESWT requires anesthesia and is extremely expensive. 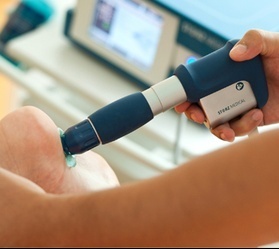 Radial Shockwave is useless for heel pain (in my opinion). The Machines I personally recommend (and have tried) are the Sonocur and Piezoson 100. They are "Piezioelectric ESWT" and are the best kind of machines in my opinion. How is it better? Click Here for a full explanation as to why its better.